The East York Historical Society and Ward 29 Bikes partnered in 2011 to launch the inaugural version of the East York History Bike Ride. Featuring more than two dozen sites in Ward 29 (bounded by Coxwell Avenue, Danforth Avenue, and the Don Valley), the self-guided tour takes cyclists approximately 90 minutes to complete by bike at a family-friendly pace while visiting four main areas in Ward 29: the institutional hub around Coxwell and Mortimer, Todmorden Village, Chester Village, and the Playter Estates. 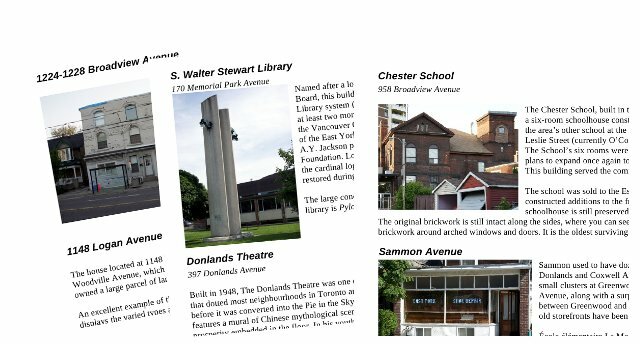 The tour materials include a printed booklet with descriptions of each property, a turn-by-turn cycling route guide, and a partial family tree for many of the prominent East York families mentioned on the tour. Download the tour documents below as PDF files, or contact us if you require hard copies. Note: the tour materials are for personal use only and all rights are reserved by the authors. Please contact us if you’d like to organize an event or distribute multiple copies. The full tour includes the tour booklet, the turn-by-turn cue sheet, and the family tree. Download and print all three documents. Full booklet for duplex printers: If your printer has automatic two-sided printing, download and print this copy of the booklet. Set your printer to turn pages on the short side of the paper (it may be called a “flip” or “notebook” setting in your printer preferences) and print the booklet as-is on letter-sized paper, without reordering or resizing pages.. Once printed, you can simply take all of the pages and fold them in half as a bundle to create the booklet. Full-page format: If you don’t have a duplex printer, you download the tour booklet formatted for full-size pages. It’s not as nicely formatted as the booklet version, but it will print easily on any printer. The guide is formatted for printing on letter-sized paper and contains turn-by-turn directions to each location on the tour. It’s easy to get lost amid the plethora of Taylors, Playters, and Helliwells mentioned on the tour and the family tree helps you to visualize the relationships between all of the family members. Is there a ride for 2017? Very informative post! I was searching this kind of post. Thanks for sharing with us.